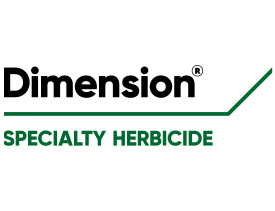 Only Dimension® specialty herbicide controls crabgrass preemergence and early postemergence, eliminating the need to switch products after crabgrass has germinated. This longer window gives turf managers more application flexibility during their busy spring season. For preemergence control, Dimension can be applied up to eight weeks prior to crabgrass germination. For early postemergence control, it can be applied up to crabgrass tillering in cool-season turf and up to the five-tiller stage in warm-season turf. It is also effective on 47 other tough-to-control grassy and broadleaf weeds found in turf and ornamental settings, making it an ideal border-to-border solution. Available in multiple formulations, Dimension won’t leave turf, equipment or surroundings stained yellow. Learn more here. ®Trademark of Dow AgroSciences, DuPont or Pioneer and their affiliated companies or their respective owners. State restrictions on the sale and use of Dimension specialty herbicide products apply. Consult the label before purchase or use for full details. Always read and follow label directions.